HE’S the astronaut who has spent more time on the moon than any of the heroes we know – and yet few of us know he even exists. It was almost half a century ago, on August 1 1971, that Fallen Astronaut was left on the moon by the Apollo 15 crew, at a location known as Hadley Rille. The shiny aluminium space explorer lies next to a plaque that lists the 14 men who were known to have died while on space missions at that time. This most unusual sculpture was the creation of Paul Van Hoeydonck, a Belgian painter and printmaker, and the special memorial to fallen astronauts and cosmonauts was kept secret until after that mission was completed. Van Hoeydonck had met David Scott, an astronaut due to be part of the Apollo 15 mission, at a dinner party. 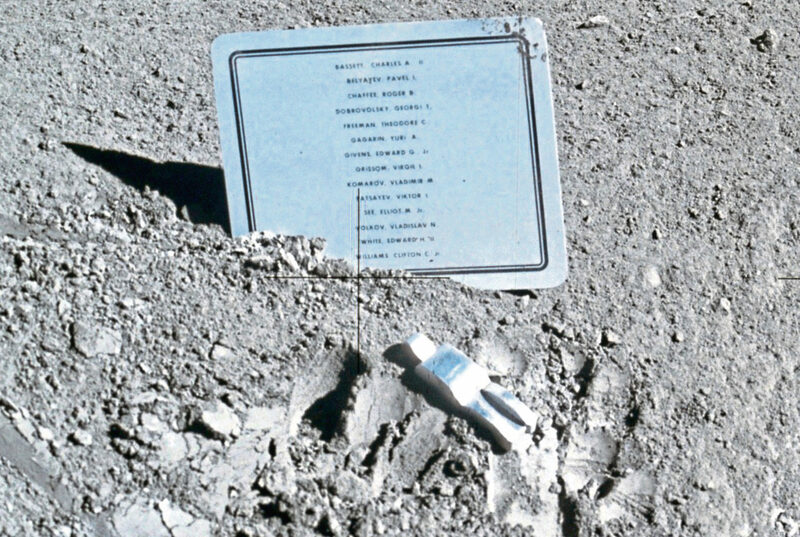 They agreed that he would make a small statuette for Scott to place on the moon, and Scott’s idea was to commemorate all who had died in the furtherance of space exploration. Unfortunately, there was a later fall-out, when the artist claimed he had an agreement letting him sell up to 950 copies of the statue. NASA has a very strict policy against commercial exploitation of the US Government’s space programmes, and eventually Van Hoeydonck gave up the idea. He had been asked to come up with a statuette that was sturdy enough to live in a part of the Universe we still don’t fully understand, but lightweight. It also had to be capable of surviving the extremes of weather and atmosphere up there. The statuette also couldn’t look like any particular ethnic group. All of which Van Hoeydonck did perfectly. It was apparently agreed – views later differed – that the artist’s identity was also to be kept secret, and Scott is said to have kept this agreement secret from NASA, even smuggling the statuette aboard his spacecraft. Van Hoeydock, however, would come up with a different version of events, and even claimed it was meant to represent all mankind, not just dead space crew. Whatever the facts, on that famous day in 1971 Scott placed Fallen Astronaut on the moon, along with a plaque bearing the names of eight American astronauts and six Soviet cosmonauts. It was later discovered that there had been a further two Russians lost, but they had never been revealed so didn’t appear on the plaque. The Americans were Theodore Freeman, who died in an aircraft accident, as did Charles Bassett I, Elliot See and Clifton C Williams. Virgil Grissom, Roger Chaffee and Edward White II died in the Apollo 1 fire, while Edward Given died in a car crash. On the Soviet side, Vladimir Komarov died when his Soyuz 1 re-entry parachute failed, Yuri Gagarin was killed in a place crash and Pavel Belyayev lost his life to illness. Georgiy Dobrovolsky, Viktor Patsayev and Vladislav Volkov all died when the Soyuz 11 re-entry pressurisation failed. David Scott photographed the memorial, along with Fallen Astronaut, and it is still up there. An amazing, if little-known, item that honours and remembers the men who made the ultimate sacrifice for the ultimate exploration.